Until the advent of the covered hopper, bulk commodities like grain and cement were usually packed in sacks and loaded into box cars. Loading and unloading was a tedious, time-consuming, labor-intensive affair. 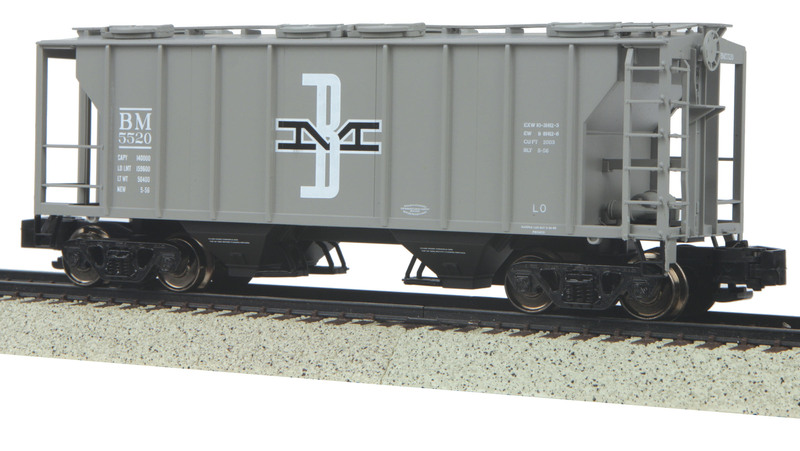 In the 1930s, responding to shipper demand for a more efficient process, a few railroads took the basic coal hopper design and added a roof with loading hatches, enabling bulk commodities to be loaded from the top and unloaded from the bottom. The Pennsylvania Railroad’s H30 was one of the first of these pioneering covered hoppers to be built in quantity, starting in 1935. But it wasn’t until two decades later that a mass-produced covered hopper took the market by storm. Pullman-Standard, following on the success of its PS-1 boxcar, introduced the PS-2 70-ton covered hopper in 1953. Like the PS-1, the PS-2 was a runaway success, finding a place on the rosters of most North American railroads and a large number of manufacturing firms. The PS-2’s all-welded construction did a great job of keeping commodities clean and dry, from grain to cement, soap flakes, salt, sand, and carbon black. In theory the cars could haul a different commodity on each trip. But the necessity of thoroughly cleaning the interior when switching commodities meant that most cars in fact worked in dedicated service hauling a single type of cargo.